Dieting and fasting provide two different ways to accomplishing fitness and weight loss. Fasting sets the foundation by detoxifying the digestive system and promoting rapid weight loss - dieting takes the baton and allows one to maintain the weight loss and improved health gained through fasting. Diets are helpful but, in my case, being 60 pounds overweight, they did not (by themselves) provide a "solution" to my life-long volatile and destructive eating habits. Now when we say "diet," we are not referring to a well-balanced nutrition program that you may adopt as a "lifestyle-change." In other words, many persons come to a point in their lives in which they understand the importance of food and proper eating and, on their own, make a firm decision to change their diets for the better. A good example is a person who goes from junk food and meat to a raw-food/vegan diet, macrobiotic diet, or some other type of healthy lifestyle. These types of changes are at the very heart of what we discuss in this website and are highly encouraged. What we are talking about when we say "diets" is the never-ending see-waw of jumping from one crash diet to another - always seeking to lose weight, always trying this regimen and that regimen - but never quite achieving true weight loss or improved health. As long as I kept putting food in my body, I was not giving it the opportunity to cleanse from all the toxicity that had built up over the years. Once I completed the fasting and cleansing process, however, a good diet then became my best ally. This was the structure that literally saved my life. Diets by themselves - at the initial state - did not totally address my distorted perception of food as comforting -- a buddy that could cover up any feeling, pain or situation at any time of the day or night. There was definitely a food "addiction" in place that I had to deal with through fasting "before" I could come back and re-establish a healthy relationship with food. Dieting and fasting was the right combination, but first I learned it was crucial to do them in the right order. Don't get me wrong - food is meant to be enjoyed and it can indeed bring us comfort. I am not referring to a healthy appreciation for food. Rather, I was constantly overtaken with a mental obsession for the "wrong foods" coupled by a physical compulsion that made it difficult to stop binging and overeating. Three AM binges for me were commonplace, even if it meant gorging on "diet" crackers or drinks. To be sure, the number of dieting and fasting detox plans out there are countless. There ARE programs that DO work and CAN help you accomplish this balance. Some of them are listed in this page. But it is always our suggestion to practice some type of water or juice fasting FIRST, before venturing into any type of diet program - especially if you are more than 40 pounds overweight. And even if you are NOT so badly overweight, doing a three-to-seven day juice or water fast before starting a change in diet can still provide an amazing foundation for the rest of your life. It is a very good dieting and fasting equation to follow. What I am saying is this: when a developer wants to erect a new building, does he not first pave and clean the terrain in which he is going to construct? As it relates to the human body then, it stands to reason that fasting can help clean out the "terrain" of the colon and digestive system, therefore making any diet you adopt later much more beneficial and fruitful. What do you think? Overall, most "crash and fad diets" consist of restrictions from sugar, fat and carbohydrates. For a discussion on the Master Cleanse detox method, go to The Lemonade Diet. Dieting and fasting both produce weight loss, yet I found them to be of benefit only if used in their proper order and perspective. My complete lack of control with food was a problem that only fasting was able to break. Why? Because fasting forced me to navigate through the pains and discomfort of cleansing and detoxification. Only then did the chains of food slavery break and I was led to freedom. The reason for this is that fasting gave my digestive system time to rest, thus allowing my body to burn through fatty acids that concealed most of the toxins that were making my life a waking nightmare. When somebody achieves a goal through pain and sacrifice, one is not so willing to simply backtrack on the progress as one would if the goal was achieved with greater ease. This was the case with me. Once the fasting was over, I found - to my astonishment- that I was no longer willing to just put anything in my mouth. The sacrifice of fasting and cleansing gave me a new perspective on food. This new perspective, in turn, gave me a fresh sense of discipline that had otherwise eluded me. The dieting and fasting equation became clear. In short, for me diets did not immediately work because, in reality, what I needed was to stop eating altogether for a season so my body could clean itself. If you are looking for a diet system to lose weight, I can tell you from experience that it can be very confusing. Once I completed the fasting process, diets then were very helpful in keeping me from relapsing into my old eating habits. My message here is that dieting and fasting each have their specific purpose at specific times for specific reasons. I tried all the diets, believe me. Yet I only grew fatter and more frustrated. Each failure usually restored me to the previous undesired weight and added another 10 to 20 pounds to boot. Various links in this page lead to what we have found to be very effective dieting programs that you may be interested in reading more about. At least for me, fasting and cleansing had to come BEFORE or could expect to stick to any particular diet - no matter how good it was. I was just too sick and toxic and my bowels were too irritated from too many years of too much of the wrong types of foods. That was the differentiation between dieting and fasting for me personally. I encourage you to diet if that is your goal, but from much experience and pain I can tell you that a three to 21-day juice or water fast will give your diet much more pep. Or even fasting one day a week, or one day every two weeks will give you much perspective on this amazing life-giving discipline. Moreover, the physical and emotional changes can be much quite profound. Weight loss with fasting is also quicker - up to one pound per day when water fasting and three to five pounds per week with juice fasting. For many obese persons, I have found rapid weight loss to be imperative to swiftly drop an initial chunk of dangerous pounds. Diets can then come in and work at transforming eating habits and eliminating the rest of the weight. So dieting and fasting can work hand in hand if you are committed to making permanent changes in how your eating and lifestyle. The MediFast program linked to the right keeps these realities in mind and I highly recommend it. I have seen it work miracles in the lives of many people I love. With traditional dieting, I was addressing symptoms and not the root cause. Fasting, for its part, gave me a new "permanent" way to live because my digestive system had time to cleanse and heal. Once I felt the high of being totally clean and free of toxins, the result was a totally new outlook on food, health and fitness. It set me free. It is my wish and sincere desire that you, too, are able to experience the miracle of fasting. It all started when I realized there was one thing, above all, that I was never able to overcome: hunger. Tried as I did, hunger always had the upper hand and overcame my most sincere desire to get fit and lose weight. I wanted to stop binging but found that I simply could not. I could make the strongest resolution to not eat in the middle of the night, yet I would wake up at 3:00 AM with a blinding voracity I could not stand against. 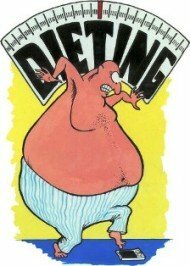 I realized that dieting and fasting both deal with hunger, but most diets - to a great extent - attempt to keep the dieter from feeling hungry. This is a very important point in this discussion. In my particular case, I found that it was crucial for me to learn to deal with my hunger and be able to confront it one-on-one. The more powerful the hunger, the more I was put face-to-face with my humanity and also with my power to choose and resist. Fasting gave me "resistance training" that strengthened my "inner muscle" to say NO to hunger and reclaim control of my life and weight. As long as I remained ignorant and inexperienced in dealing with my basic human appetite of "hunger," I found I would time and again fall prey to its temptations. A diet - the first three letters D.I.E are enough warning -- puts the person on a regimen. It tells me to eat this but to abstain from this or that. But...hehe - if the diet told me not to have sugar; guess what I craved the most? You guessed it - sugar. If I was to not eat fat or carbohydrates, then fat and carbohydrates became the immediate focus of my longing and obsession. Before long I was gorging again. Or perhaps I would stick to it for a week or several months, only to crash and burn in a weekend splurge that left me feeling like a loser, a weakling. What I failed to realize back then was that the cravings themselves were a sign that my body needed to undergo a fasting and cleansing process. That cravings, in essence, were the result of the body asking for whatever food it was that filled me with toxins. Giving in and eating actually fed my toxicity and prolonged my addiction and suffering. This is sort of like a person who is trying to quit smoking that gets an urge to light up. I had to go through a food withdrawal... period. But you are not alone. When you have time, join is at Fasting Motivation and Fasting and The Mind. Also, if you are serious about dieting and fasting to lose weight, you may also want to consider starting a Fasting Journal to record the thoughts, feelings and positive changes that will occur as you fast. If you have any specific questions, please do not hesitate to Contact Us. The objective is to help you get started in a dieting and fasting program in any what that we can, and then offer whatever support you need to see it through and reach your weight loss, health and fitness goals. Now let us continue our dieting and fasting discussion on The Liquid Fasting Diet. *Visit Our Amazon Fasting Shop for My Top Pick fasting and colon health books, juicers and extractors, cleansing kits and supplies.